22 Days until the Barrie Colts Home Opener! 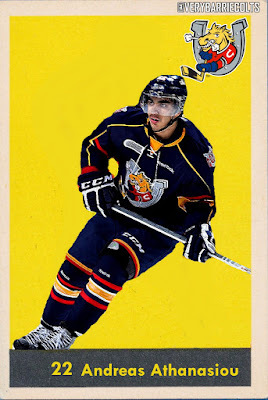 (Andreas Athanasiou) #OHL - Very Barrie Colts | A website covering the Barrie Colts of the OHL. There are 22 days until the start of the Barrie Colts 2017-18 regular season! Andreas Athanasiou wore 22 with the Barrie Colts for two seasons. He was selected 81st overall at the 2010 OHL Priority Selection Draft by the London Knights. After two seasons in London the team would trade him to Barrie for a pair of picks with a conditional selection. Over his first couple of seasons in London, he posted 33 goals and 26 assists, totaling 59 points. Athanasiou would surpass that point total in each of his seasons in Barrie. In 2012-13 he made his Colts debut and scored 29 goals and total 67 points. The team Would make it to the OHL finals that season to face Andreas’ former team, the London Knights. London would win the series in 7 games but Athanasiou had an outstanding performance with 12 goals and 13 assists in 22 playoff games. His final season in Barrie would be the best of his OHL career posting a career high of 49 goals and 46 assists to total 95 points. 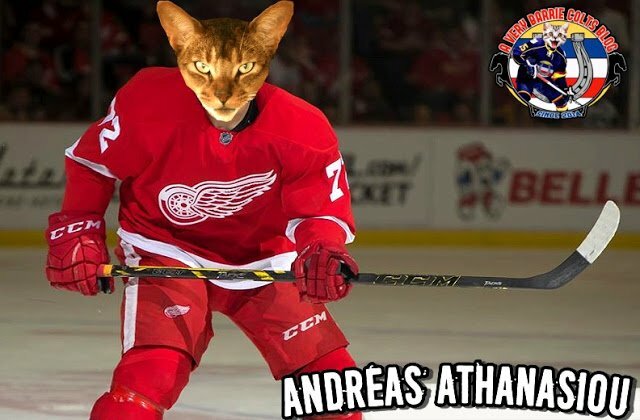 The team didn’t make it as far in the playoffs that post-season, however Andreas would still put up more than a point a game with 12 points over 11 games. 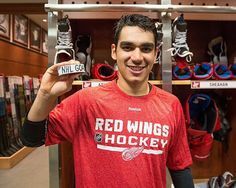 Over 4 OHL seasons Athanasiou played in 252 games and scored 111 goals and 110 assists for 221 total points. He played in 50 playoff games and contributed 42 points. Athanasiou was drafted at the 2012 NHL Draft 110th overall by the Detroit Red Wings. He saw time at the NHL level, as well as in the AHL with the Red Wings AHL team, the Grand Rapids Griffins. He played 101 games with the Wings where he scored 27 goals and added 16 assists. His deal with the Wings is up and last we have seen, talks haven’t gone well. There is word out there that he has even been approached by the KHL. Some have even suggested the Montreal Canadiens have expressed interest. Here are some more fun numbers from Athanasiou’s hockey career so far. with some highlights. His 101 NHL games is the 22nd most NHL games played by a Barrie Colts Alumni player. Did we say there are 22 games left until the Colts season yet? 49 goals in 2013-14 is the 4th most goals in a single season by a Barrie Colts player. 2012-13 saw Athanasiou score 10 game winning goals which has him tied with Bryan Little (who did it twice) for most game winners in a season. Only Alex Hutchings scored more (11) in the 2009-10 season. In 2013-14 he scored 4 shorthanded goals which has him tied with Justin Scott for the 9th most in team history.